GREEN BAY, WI – Strawberry Fields Design, Inc., an award-winning graphic design and website design firm, has been ranked among the top 15% of designers in the nation by the 2011 Go Green Advertising Awards for its creative and eco-friendly promotional materials for FuzziBunz®. The Gold Award was received in the Retail Design category, judged by a diverse panel of marketing experts. Go Green Advertising Awards (GGAA) is the nation’s premier advertising awards program that exclusively recognizes outstanding creativity in advertising while being more conscientious towards the environment. GGAA Program Coordinator, Melinda Lucas, noted that the number and quality of entries exceeded the organization’s expectations. Only promotional materials that were produced using sustainable and/or green advertising efforts in 2010 were eligible to enter. FuzziBunz® is the creator and seller of modern, eco-friendly and reusable cloth diapers. Its patented design ensures babies stay dry and comfortable and is adjustable to fit children of any size. The marketing materials created for FuzziBunz® include: website advertising design; packaging; print and trade show design; logo design and most recently print designs for the diapers themselves. You can see the work at www.strawberryfieldsdesign.com. The Go Green Advertising Awards (GGA Awards) is the most elite, national-level advertising awards program developed specifically for the promotion of green-themed products and services. Advertising agencies and organizations in the past several years have begun producing campaigns promoting their choice to do business in a more eco-friendly manner. 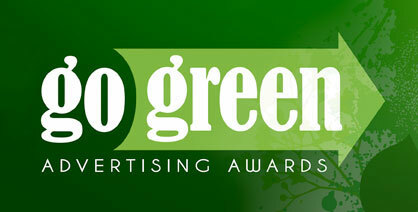 The GGA Awards recognizes excellence in green advertising efforts.